It's only been a few years since you had to pay in order to get a trusted SSL Certificate. Then just about 2 years ago, the EFF together with the Mozilla Foundation and several others have decided join forces and launched Let's Encrypt with the goal of having 100% of the web traffic run over HTTPS by issuing domain validated certificates - free of charge! Fast forward 22 months and let's encrypt is servicing a huge ~50 million certificates. Until a few weeks ago, these were certificates that wouldn't allow wildcards, but that has just changed! In order for you to get a wildcard certificate, the only valid verification method is DNS based. As such, I thought it would be useful to run through the process of doing this, in my case using OVH's DNS. That's it. You now have a running version of certbot. We'll have to set up the custom hook in order to allow Certbot to automatically verify the domain for wildcard use. Currently it is not possible to validate ownership of a domain for wildcard certificates any other way. 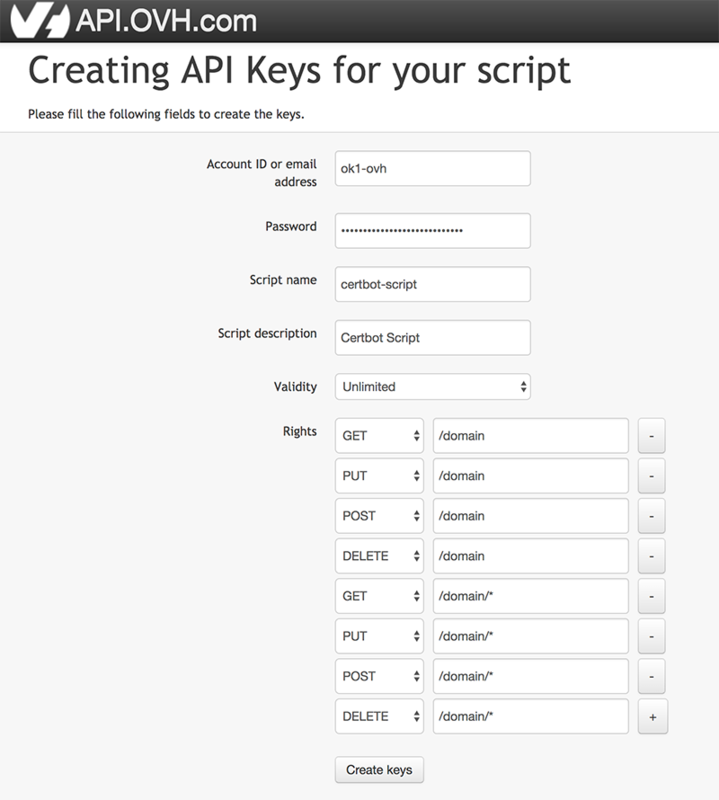 Luckily, antoiner77 has already written a script making this a simple automated process. Once generated, you'll receive the Application Key, Application Secret and Consumer Key. Keep them safe. Step 3 - Get your wildcard certificate! Now that we've got everything set up, there's only one step left. That's getting your shiny new wildcard certifcate from Let's Encrypt. One last optional step is to set up the automatic renewal of the certificate. This will run certbot every 10th of the month at 14:32. As certificates have a 3 month validity, this should be more than enough.